St. George in the East, Wapping. bl.uk > Online Gallery Home	> Online exhibitions	> King George III Topographical Collection	> St. George in the East, Wapping. 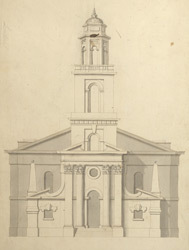 This is part of a series of eleven plans, elevations and sections of St. George in the East, Wapping, built in 1714-29. In the 1850s the rector and curate of this church introduced what were considered Romish practices, inciting the Bishop of London, A.C. Tait, a Presbyterian, to appoint a Low Church afternoon lecturer in retaliation. This prompted raucous demonstrations; men came into church with their hats on, shouting, blowing horns, smoking pipes, leading dogs and throwing refuse onto the altar. After the church had been closed in 1859, Tom Hughes, the author persuaded the rector, to hand over his duties to a locum.